In order to allow remote sectionalizing of important loads for faster service, two 115 kV switches were motorized using 24 V motor operators powered by batteries. The 24 V sealed batteries are charged using a 300 W solar array. The equipment is controlled using a radio linked remote terminal unit. 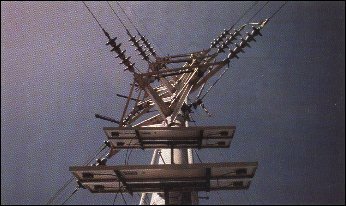 Distribution lines are not always available so the use of AC transformers to motorize remote transmission line switches is in many cases not practical. Using solar power provides quick and convenient access to sectionalizing transmission lines without sending service personnel into the field.